Great Gathering Place For Groups. This Is The Montana Group. 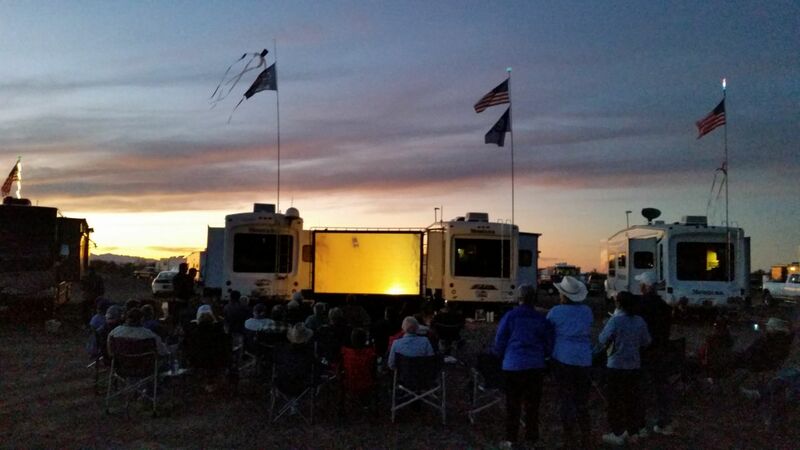 With so much BLM land (both 14-day limit, free sites as well as long-term fee sites) that surround Quartzsite, it makes it an ideal place for large groups to gather. With people’s travel schedules and lives that get in the way, this can be a great place to meet up once a year and catch up with friends. Potlucks, bon fires, crafting lessons and a movie night (that we put on) are great ways to enjoy each other’s company. 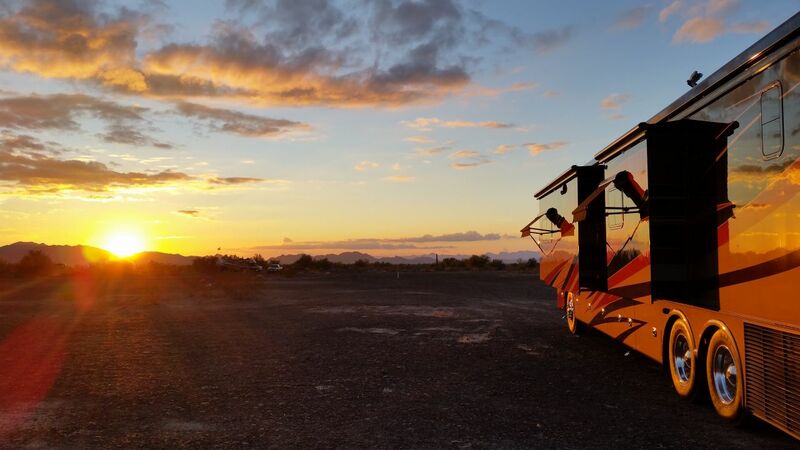 Since most choose to park out in the desert, with all of the vastness of dirt, rocks, tumbleweeds and cacti, everything can really start to look the same. 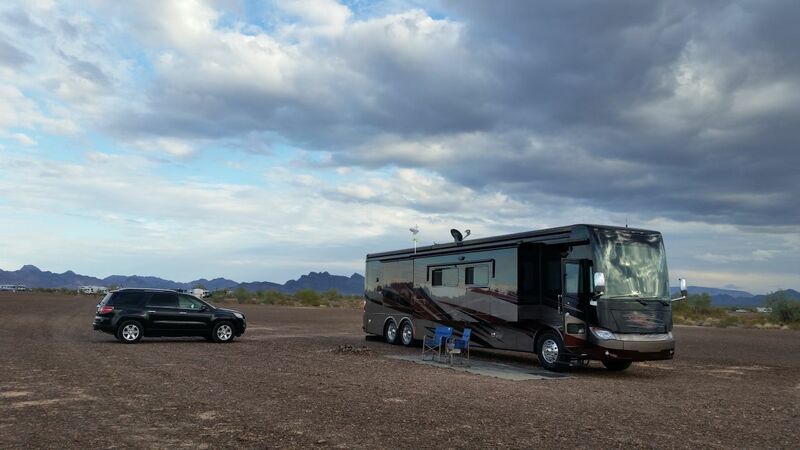 David did a great video of where we were parked to get an idea of the vastness around us and to prove that yes, you can boondock with an all electric, luxury motor coach out in the middle of nowhere. Also to prove to our family and friends that we actually did take our coach off road. We ended up lasting 12 days before we left. However, with the state our tanks were in, we could have easily lasted a few more days, but alas, it was time to move on for us. We filled up our diesel before we parked for those 12 days and also filled back up after we left to get an estimate of how much it actually cost us to boondock in the desert. When we filled up we were surprised that we had gone through 42 gallons of diesel (we have a 150 gallon tank). We filled up at $2.70 a gallon, which came out to $113.40 bucks. Divide that by the 12 days we were out there and we spent $9.45 a day to boondock. Certainly less than an rv park would have cost. Now, we had not done any serious boondocking since we bought this coach, so this was a test of our tanks as well as our 2 solar panels that we have on our roof. We do not have the capability of tilting them, nor did we position our coach for maximum exposure, as we didn’t remember to when we parked and set up. With that in mind, we still believe that our solar panels were not working properly. So, under different circumstances, we may have faired better. 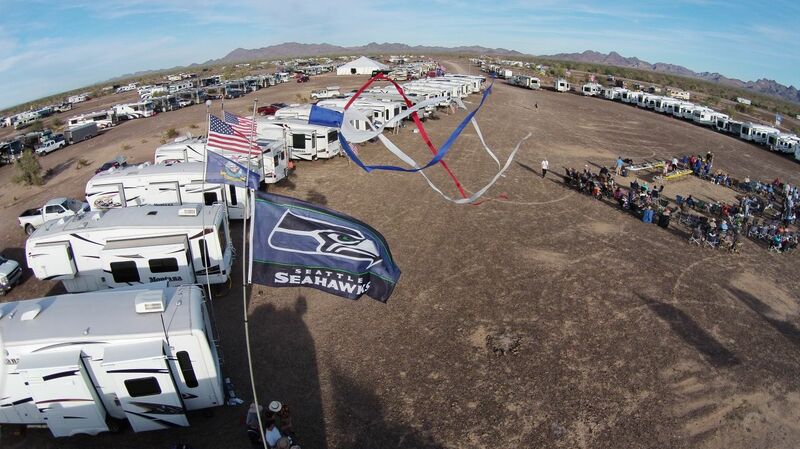 Unless you park in a large group, like the Montana group above or you park in town at one of the various rv parks, you may need a little help in finding your spot when coming back from town. Flags are a great way to help identify where you are parked. 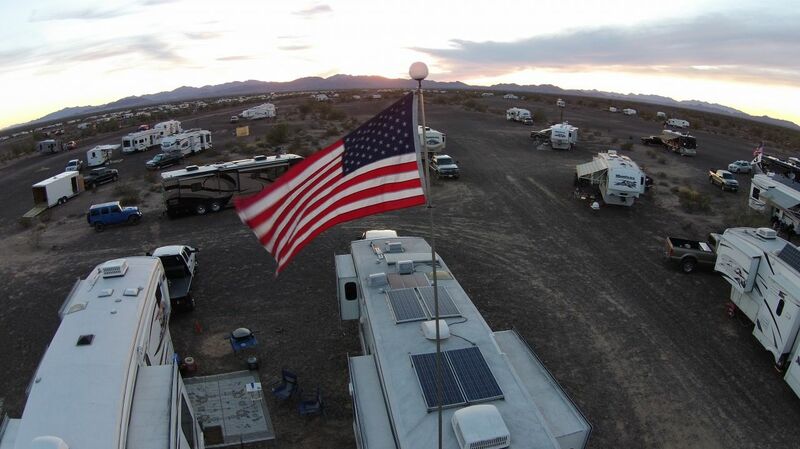 Not only are there various flags (American, sports, military, etc) that you can adorn your coach with, many flagpoles can have solar lights and such added to the topmast. So if you happened to not park in a large group, when trying to find your way back home in the dark, and it gets really dark out here, these lights can be a nice addition as well as landmark. But don’t fret if you don’t have a pole, flag or lights, it can all be found here under and around the tent during the show. 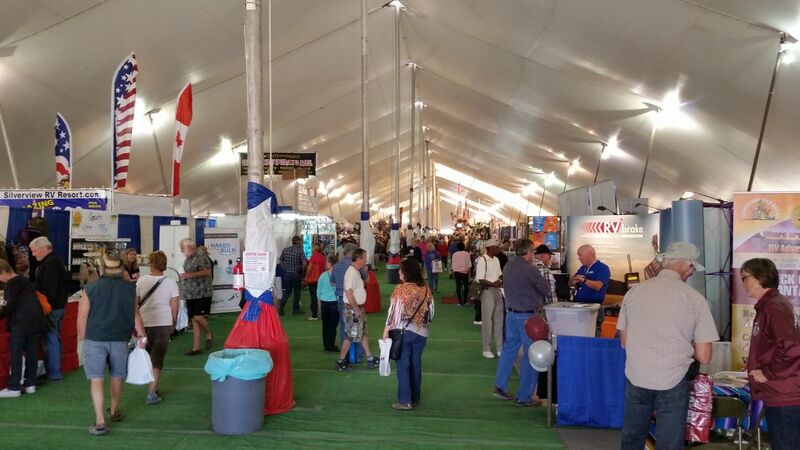 Speaking of vendors and the tent event, this place is huge! 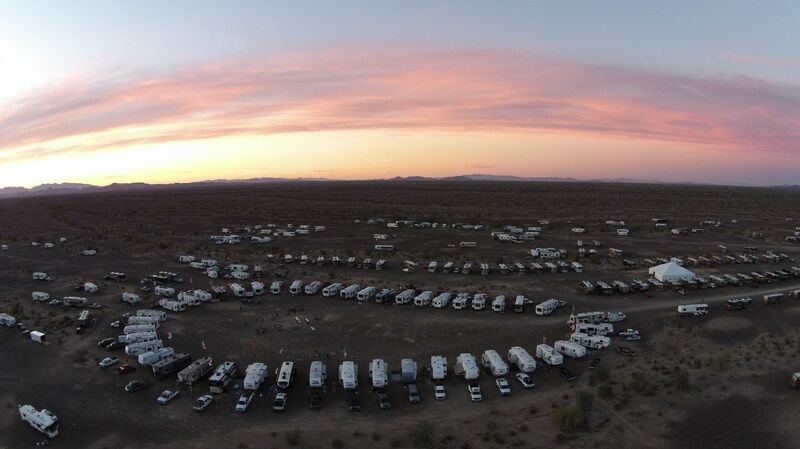 A great, and FREE, event for Rvers, you can find everything and anything you ever thought you might and sometimes might not know you ever needed, here in one place. 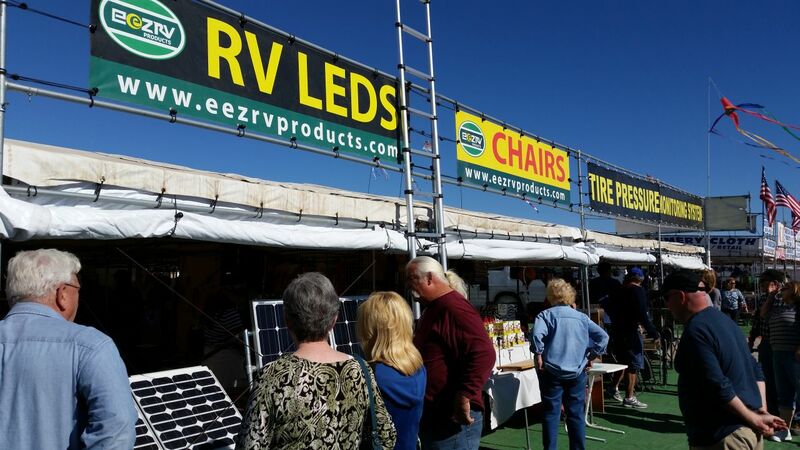 There are vendors selling new items such as expandable ladders, LED lights, chairs and yes, the ever-popular flagpoles, flags and lights for said poles. Other wares such as crafts, specialty foods, camping memberships, surplus tools, rv parts and everything in between can also be found all over. The tent is not the only place for shopping. Oh no, there are vendors set up around the tent, across the street in the Tyson Wells area, all around town on Main Street as well as across highway 95 (which runs north/south through town). Let’s not forget one of the favorite stops for all of us, I’m sure, the food vendors. 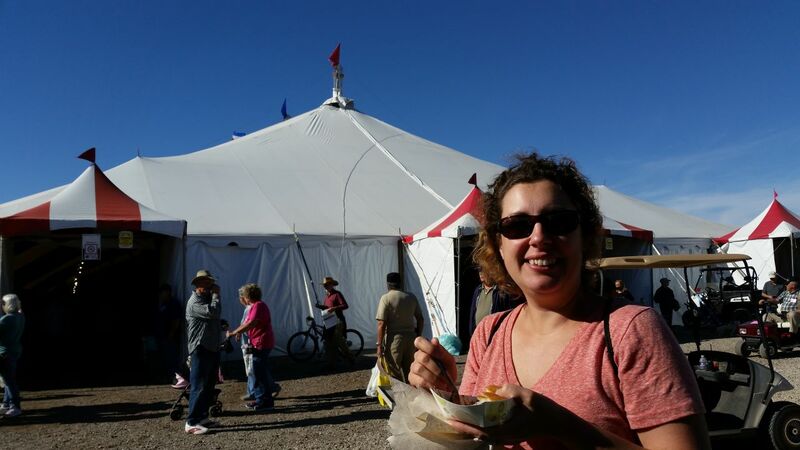 Can I just say the “Carny” food is always a good choice for something to indulge on. The food vendors are as vast and different as the rv vendors. 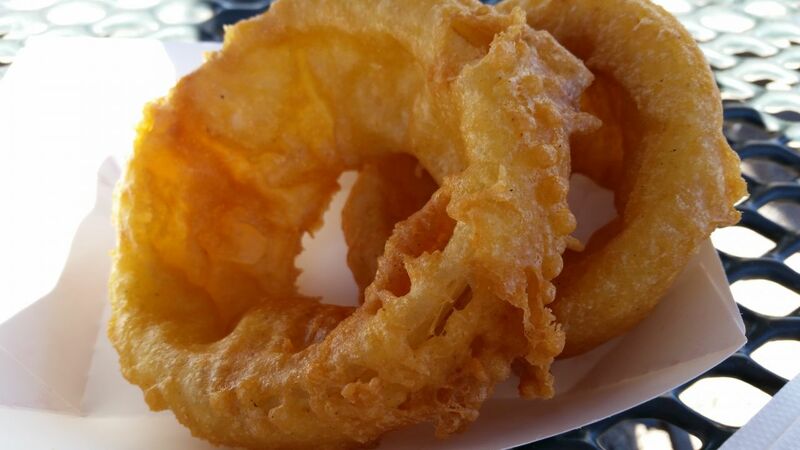 You can find hand-made ice cream, wood fired brick pizza, BBQ, fresh mini donuts, hand dipped, beer battered onion rings, fried dough, fresh cut curly fries. The choices are endless. I can feel my arteries clogging as I type this. After indulging, or (clearing my throat), over indulging, a nice long hike may be in order. 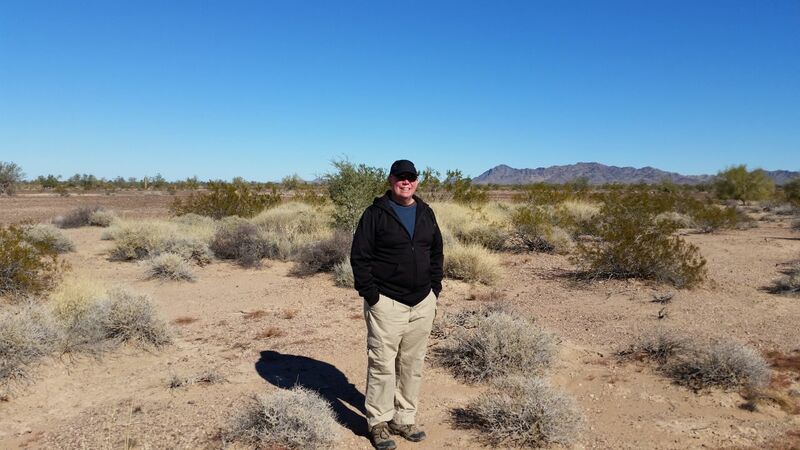 If you have not walked the tread off of your shoes yet while shopping around town, you can always get out and walk around the desert and the various hiking trails that can be found. Being that most people park outside of town on BLM land, you can just step outside your coach and take off. 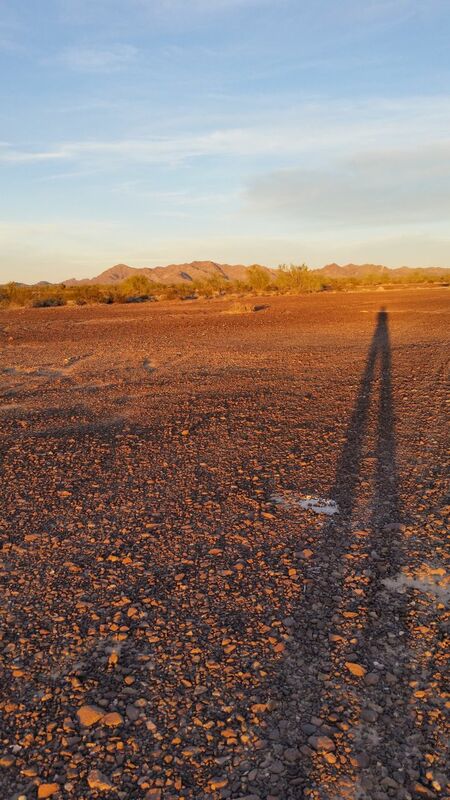 Sunset is a great time to be outside enjoying the desert. 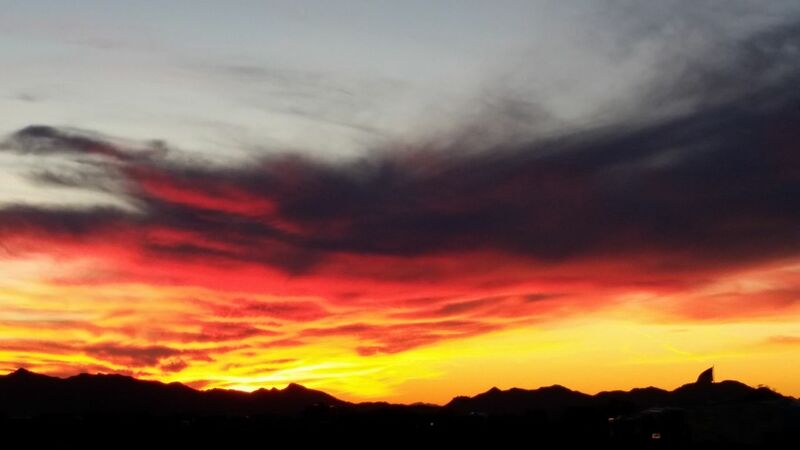 The sunsets out here in Arizona are simply spectacular. You can see all around you for miles, surrounded by mountains, they can be breathtaking. 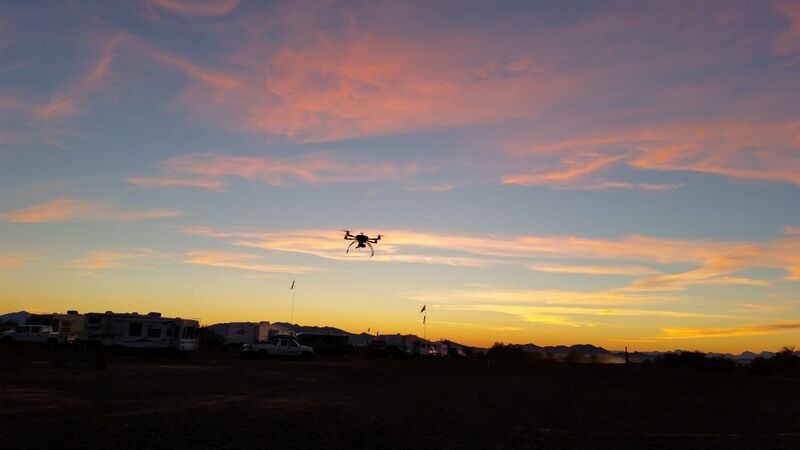 It’s also a great time to get some video of the sunsets with the quadcopter. Speaking of the quadcopter, this has to be the most quadcopters we have seen, in one area, flying around. The desert can be a great place to fly because you don’t have to worry about trees or wires getting in the way. You can do some really great long distance flying and the odds of having a signal interrupted out here are minimal. There really is nothing around to get in the way of some good flying. David had a personal best of 1.86 miles away and thus back totaling 3.72 miles round trip, with a top speed of 63 MPH! Whew! David did a great quadcopter video showing the surrounding camping areas and the tent event around town. This should give you a good idea of what to expect and the shear scope of things if you have not been to this area before. This area is ripe for outdoor sports. Off roading, ATVing, paragliding, even hot air ballooning can all be found around town here. Enthusiasts from all over the country come here to fly and 4x4 and such. You never know what you’re going to see. Just the other night David was out flying his Phantom quadcopter (because it’s easier to see with it’s lights) playing with another Phantom quadcopter pilot who was at another coach at another part of the desert, while watching a paraglider land in the sunset, while people were outside starting up there campfires and grills. It may be the desert. Life may be harder out here. You may have to tweak your habits a little to boondock longer periods of time, for example taking “Navy” showers and such. But the rewards are endless. New and old friendships are made. Even if it comes with a layer of dirt. Care to join us next year? We’re considering getting a group together. A campfire talking, outdoor movie-watching, cook out happening kinda group. Some quadcopter flying may be involved. 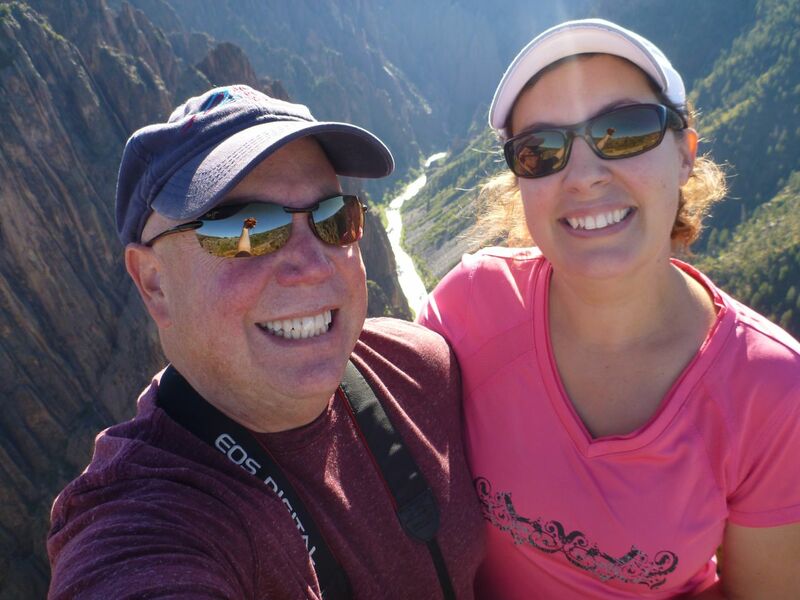 I’m the retired veterinarian and we met at the Grand Canyon campground. Hi Gary! Yes, of course we remember you two. Great to see you’re following our adventures. BTW…BK (our kitty) is having no more issues once we switched over to Science Diet. Thanks again for that! I’m enjoying your site. I recognize David’s name from when I worked on Tivo’s online marketing. We’ve camped a little further out of town and it’s great if you want some more space. Hey David, as for your solar not being “that” helpful, you might check two things. 1. do you leave your inverter on all day? If so, it robs power. Turn on inverter only when needed. 2. is your refrigerator on automatic? We thought that was the correct setting and found that when on A U, it used the solar power for electricity to run the fridge. When boondocking, use LP setting. Hope that helps. We have an all electric coach so the inverter has to stay on as our fridge is a residential home one and thus does not run on propane. But thank you just in case. Joanne and I are in for next year. We so love the desert. Would love to meet up with you again next year. Sounds like fun. Love to know more about your quadcopter! Not sure what there is to tell. :) One hand built Xaircraft X650 and the other is a DJI Phantom Vision 2+. The X650 one is the one I flew out 1.86 miles with. It is also the main one I use for videos. Been flying for about 3 years now and was the first frame I built. Please keep us informed about next year. Starting to full-time in March. Cold turkey. Selling house in a month. 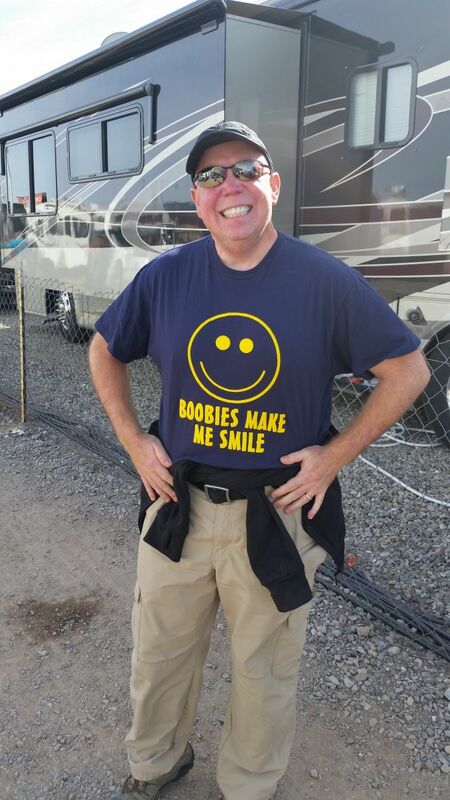 Would enjoy meeting you at Quartzsite if we have figured out how to full-time successfully by then!! It was great to hang out with you guys for a bit.. thanks again for the awesome drone footage! It was great to meet you also. Love it when we can put people with words. You cat is a blast…loved the Jackpot game! Glad you also liked the video we did for you. Thought it came together well. Keep safe! Hey, guys! Just stumbled upon your blog and wanted to jot a note to say WOW! Love it here! I am home recouping from surgery so I’ve been enjoying your little copter vids–it’s making the time go by faster for me. We are not rvers (yet) but may be someday. Until then, I will very much enjoy my armchair travels through the eyes of your “copter” and informative commentary. Thanks! Rhonda, in middle Tennessee. We hope to be there next year and would enjoy a get together! David and Brenda, We would like to join you in Quartzsite next year. As you stated in your post, it is a ways off, however we would be interested. We would love to join you next year! Would love to join in the fun. Never been there. First saw you at the Rally in Indio 2015. We were in QZ for 10 days and just left a few days ago. We’d be interested in joining you all next year. Irene and I would DEFINITELY be interested in coming out next January. We winter in Mission, TX now so it isn’t too far and we have a grand baby we can see in Tucson, AZ both coming AND going. How far from a big airport? I want to do this next Jan. /Feb. Not sure…But Google says Major Airport would be Phoenix. About 2 hours away. Will be there next year. Would be great to stop in & say hi. Enjoying your blog. We would be very interested in joining in next year. We are new to RVing and buying our new coach this Friday. Very eager to get started..
We would love to join your group next year. We were in Quartzite this year with one of the Tiffin Groups. I would be interested in connecting also. I have one sUAS I fly currently and parts for two more almost gathered. It will be our first time there but would really like to be with a group and enjoy the fun and company. It sounds like a blast ! I am on my way to Mesa AZ as I am writing this email. My plans are to join your group. Keep me posted of the details. Would be interested in seeing you fly your copter. I enjoy reading your blog. Hope that there is enough interest to make this event happen! We have never been to Quartzite and would be interested in joining your group. John is also very interested in getting a drone and would enjoying talking to someone with experience. Thanks.